The Ruby Stella d’Oro daylily has all the wonderful qualities of the traditional yellow Stella d’Oro. It’s very tolerant of the strong summer sun that we deal with here in the Carolinas. It blooms early in the season, adding a deep red color to flower beds and naturalized landscapes. 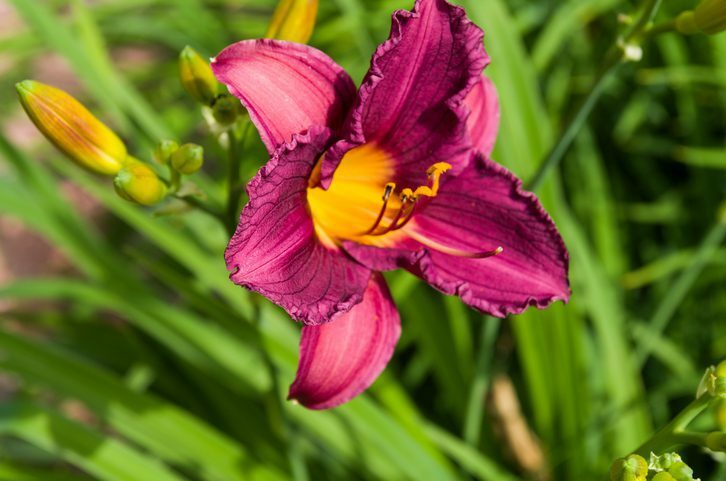 As a reblooming daylily, you’ll continue to get blooms up until the fall. Since it requires very little maintenance, you’ll get to enjoy the show without putting in a whole lot of work—every gardener’s dream! There are numerous other benefits of adding this to your landscape. The Ruby Stella d’Oro attracts butterflies and hummingbirds but is resistant to rabbits and other pesky wildlife. You can also use this as a cut flower in arrangements since it’s both stunning and fragrant. You can also have great success if you choose to plant it in containers.